Looking for a love potion for that special someone this Valentine’s Day? Young Living can help you create the “magic elixir” of quality time and essential oil-infused gifts that will make your loved one burst with affection! There’s no better way to demonstrate your appreciation for your valentine than helping him or her relieve stress and tension with a combination of Young Living’s massage oils and essential oils. Young Living massage oils provide a perfect vehicle for you to give your time and attention to the one you love. A foot or hand massage is a quick and easy way to relax the entire body. Sensation Massage Oil inspires the senses and encourages feelings of romance and youthfulness. Ortho Ease Massage Oil relaxes and calms tired, stressed muscles. Ortho Sport Massage Oil soothes tired, over-worked muscles after exercise and sports. Relaxation Massage Oil promotes tranquility and eases tension to restore vitality. Cel-Lite Magic Massage Oil improves skin texture and helps cleanse the skin. DIY Tip: Create your own massage blend using V-6 Vegetable Oil Complex infused with a custom blend of essential oils. Add a blend of your favorite essential oils to Epsom salt for a relaxing and thoughtful gift. Pour 4 cups of Epsom salt into a nonreactive bowl. Add up to 15 drops of your favorite essential oils. We suggest Lavender , Roman Chamomile, Eucalyptus Blue, Eucalyptus Globulus, Eucalyptus Radiata, Stress Away, Peace & Calming®, Sandalwood, Joy, or your favorite single oil or blend. Use ¼–½ cup per bath. 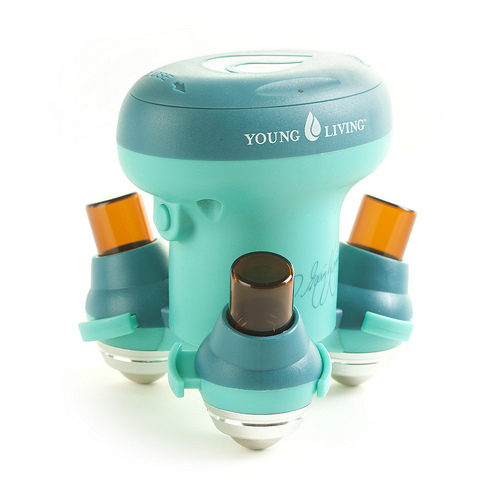 Young Living’s essential oil roll-ons are a convenient, easy-to-transport, and clean way for your loved ones to apply essential oils when they need a little relief from a stressful day. Deep Relief Roll-On provides support for occasional muscle tension. RutaVaLa Roll-On promotes relaxation of the body and mind. Stress Away Roll-On encourages relaxation. Tranquil Roll-On helps decrease uneasiness and induce tranquility. Valor Roll-On increases strength, courage, and self-esteem. DIY Tip: Create a custom essential oil roll-on blend by adding an AromaGlide Roller Fitment to your oil bottle. Fill the 2-ml bottles that come with the Vitassage with your favorite essential oils and incorporate the benefits of up to three essential oils or blends into your massage. Mix 2 drops of Hong Kuai, 1 drop of Ylang Ylang and 3 drops of Idaho Blue Spruce for a gentle, empowering cologne that will instill greater confidence and perseverance. Blend 2 drops of Ylang Ylang with 1 drop of Hong Kuai for an all-natural, appealing fragrance. Add 1 drop Jasmine, 5 drops Coriander, 6 drops Bergamot, 3 drops Rose, and 4 drops Neroli to 10-ml of V-6 Vegetable Oil Complex for a delightful perfume. Blend Ylang Ylang with your favorite Young Living lotion for a lasting, attracting fragrance. 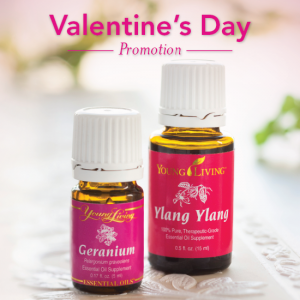 Make this Valentine’s Day memorable with Ylang Ylang and Geranium essential oils! From February 7–9, buy one 15-ml Ylang Ylang and receive a 5-ml Geranium for free! Known for their delicate, floral scents, these oils will bring a calm feeling to your home and set the stage for your special day. Limited to five per order. To take advantage of this special offer, log in to Virtual Office by clicking here. As always, we would love to hear from you! 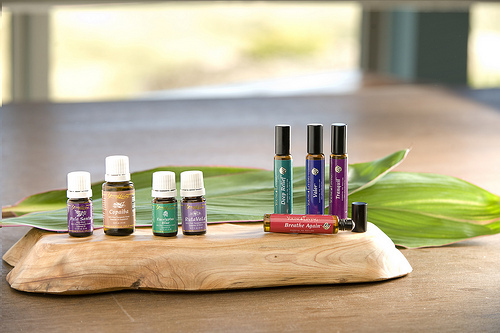 Leave a comment below telling us your ideas for Valentine’s Day gifts using Young Living essential oils.